An animation can be constituted from shapes, pictures, videos, as well as audio files for that extra touch of class. With the aid of the built-in image editor, graphics can be refined and enhanced in order to look both natural and unique. You can also insert links to YouTube and Vimeo, which will be played with the aid of the built-in HTML5 or Flash technology. Additionally, the script engine allows you to embed slideshows inside the animation with fade or slide effects. The output HTML file can be played in any browser or on any modern device such as smart phones or tablets without requiring additional plugins. The bottom line is that Hippo Animator is a great asset especially for web designers, creating HTML animations in a faster and more comfortable manner than other similar applications. ?Easy to use Editor. 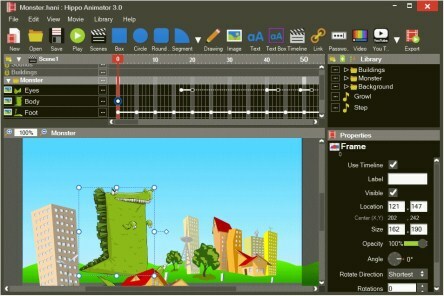 Hippo Animator is a powerful yet easy to learn editor. ItжЉЇ simple to create great looking animation quickly. Perfect for beginners and experts. Help is included, try the video tutorials and youжЉЈl be up and running in minutes. Customise the look with light and dark interfaces. ?HTML Export. Hippo Animator exports a single scalable HTML page and a folder of images. You only need one line of code to add the animation to your own web pages. ItжЉЇ as simple as we can make it. The HTML animation is cross browser, search friendly and doesnжЉ° require any browser plugins or downloads. ?Works on Phones and Tablets. Flash, Silverlight and Java animation is usually not supported by phones and tablets. Hippo Animator supports iPhone, iPad, Windows Phone and Android to name a few. The movies automatically scale to fit any web browser size. ?Works in old Web Browsers. Many HTML animation software packages use HTML5, which is great, but it only works in a small number of new web browsers. Hippo Animator is different, your exported movie includes both modern HTML for new web browsers and old HTML for older web browsers. It even supports Internet Explorer 6. ?Vector Graphics. Hippo Animator uses vector graphics whenever possible. This means fast downloading and perfectly smooth edges no matter how big the movie scales. Included with any exported HTML movie is a folder of images that are used in old browsers when vector graphics is not available. ?Image Editor. Hippo Animator has an image editor built in. You can resize, rotate, crop and flip your images without leaving the editor. You can also add effects like blur, noise, contrast and brightness. ?Buttons and Interactivity. Add interactivity to your animated movies using buttons and a simple set of script commands. No previous scripting knowledge is required. Just select the command you want to use and fill in itжЉЇ options. ?Slideshows. Quickly create slideshows using the image viewer object. Fade or slide between images. Load large images after the movie has loaded. Control the show using script commands to play, pause, go back and forward. ?YouTube and Vimeo Videos. Add YouTube or Vimeo videos to your movies. If you donжЉ° want to use those, there is also a page object that allows other web pages or videos to be embedded in your movie. ?Audio. For that extra touch of class, add music and sound effects to your movie. Hippo Animator supports web browsers like Firefox that donжЉ° support MP3. Hippo Animator 3.5.5231 from rapidshare mediafire megaupload hotfile, Hippo Animator 3.5.5231 via torrent or emule, full free Hippo Animator 3.5.5231, Hippo Animator 3.5.5231 rar zip password or anything related.